The December 2009 Daring Baker's Challenge ~ Gingerbread houses! Wheeeeeee! This month was hosted by Anna of Very Small Anna and Y of Lemonpi. A very fine seasonal choice, Ladies. 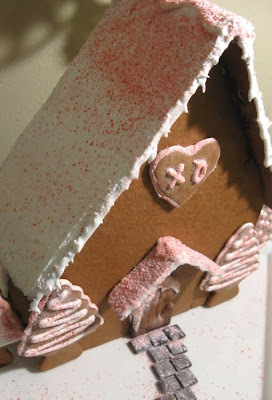 I don't recall ever making a gingerbread house in my life. I state that as if I am 83 and recalling Christmases past. In reality, I'm 46, perimenopausal with young children. I'm happy to remember I like gingerbread. This is a spice dough. I was out of ginger. Oy, I'm only a baker, ya know. A slightly disorganized one. 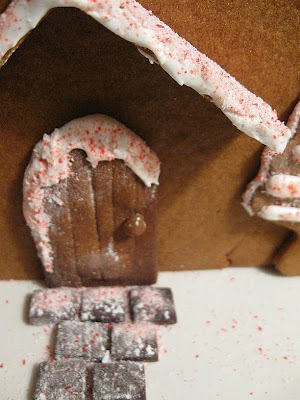 I can't say I was crazy about the recipe I used, but I have no intention of eating this house. I might shellac the darn thing and bring it out every year. (kidding) I'm listing the recipe because it's what I do. The recipe matches the post, excitement or not. It was easy to fall apart after rolling, challenging to transfer to a baking sheet. It's easier if you roll it out on parchment, then cut. Because every challenge has good in it, here is what is nice about this rather finicky dough....it bakes up very nicely, hardens beautifully, it's a sturdy dough, hard rather than crisp, if rolled thin. Add butter, sugar, molasses, water and vanilla. Mix using paddle attachment. Roll out thinly, 1/8" if you are comfortable with that. Bake at 375 degrees for 12-16 minutes depending on size of cut out. Longer if rolled thicker. Add water to merigue powder, mix well. Add creme of tarter, mix well. Mix on lowest setting for a few minutes. If you continue to mix this after it becomes fluid and creamy, it will get stiffer, which is a nice and different consistency. 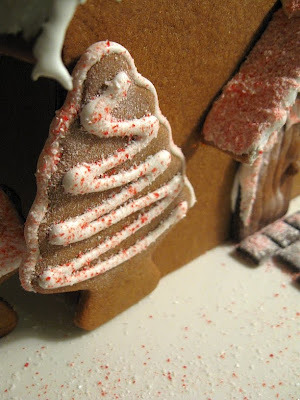 The back of my gingerbread house shows the difference, frosting rather than icing or flooding consistency. I glued the pieces together with caramel. This can be found here, it sure was handy instead of using stiff royal icing as glue, quicker and only one person needed to hold pieces. I halved the recipe. I'm actually proud of my little gingerbread home. I think I was beaming...I still might be. Merry Christmas ~ it isn't over yet! It looks fantastic, I love the shape and the cute trees. Great job! 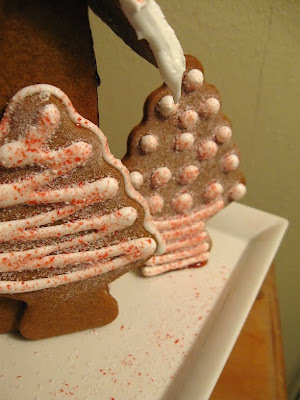 .. love those little trees.. Did you use a cookie cutter to cut those out? Hmmmm, beautiful, so smooth and sweet! I love the peppermint snowfall - its so fun! Your house is fantastic =D. You're rightly proud of your house, it's wonderful! I love the peppermint dust--is it just crushed peppermint canes? Lovely compliments ~ thank you! Y ~ borrow away. I have a belief that nothing is new, only new to someone. 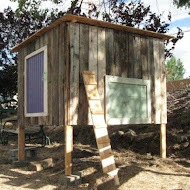 Thanks for picking a great December challenge and hosting as well. Angela ~ I used Kencraft's Peppermint Sprinkles, purchased at a local store, half off. I see Amazon has them on their site. http://www.amazon.com/Peppermint-Sprinkles-Kencraft-5-8-Oz/dp/B002VSO2V2 What is nice about the sprinkles is how little is used, how fine the granules, like sand. They will start to melt the moment they make contact with fingertips. 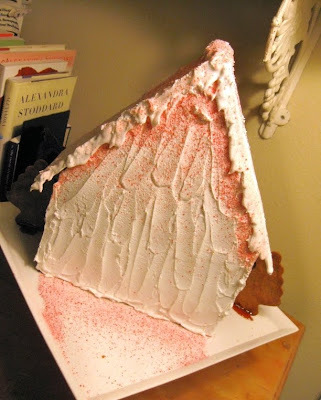 Crushed candy canes would do the same, but I would avoid using a food processor due to the heat. Instead using a heavy freezer bag and a rolling pin, whappin' and rolling until desired size. 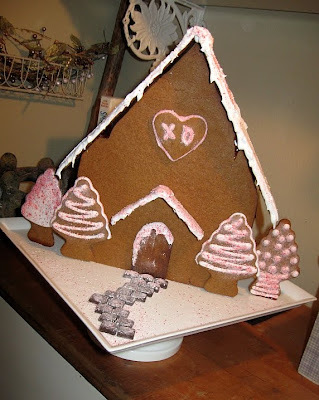 Your gingerbread house is amazing! And so are you! What a adorable house! :) Happy 2010!